Third-ranked senior Daniel Vallverdu cruised into Saturday’s semifinal at the ITA National Intercollegiate Indoor National Championships in Charlottesville, Va., with a six-match win streak. Due to a pectoral injury he suffered during the second round, however, Vallverdu had to withdraw from competition. Prior to the injury, Vallverdu knocked off two top-25 opponents on Friday – 22nd-ranked Oklahoma junior Andrei Daescu, 6-4, 6-2, in the round of 16; and fifth-ranked Southern California junior Robert Farah, 7-6, 2-6, 6-1. In the opening round, Vallverdu earned a 6-1, 6-4 straight sets win against Denver sophomore Martin Zimmerman. With the fall season over for the men’s team, the Hurricanes will open the spring season in January. On the women’s side of the court at the ITA Championships, things didn’t go as well for Vallverdu’s younger sister, Laura, who was upset in the opening round and later lost her third-straight singles match for the first time in her career. She and sophomore Michaela Kissell fell to Texas’ No. 12 pair of junior Vanja Corovic and senior Marija Milic, 8-1. The 15th-ranked Hurricane duo (3-3) bounced back on Friday in the consolation draw with an 8-1 win against Duke’s third-ranked pair of junior Amanda Granson and senior Melissa Mang, but dropped a match on Saturday in three sets to USC junior Gabriela Niculescu and sophomore Maria Sanchez, 3-6, 7-5, 6-2. 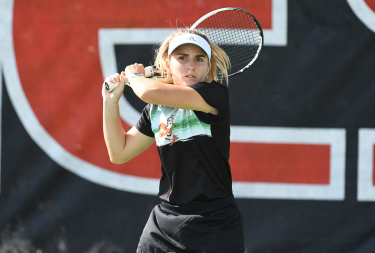 At the inaugural UM Women’s Tennis Fall Invitational, sophomore Bianca Eichkorn, ranked 109th, claimed the singles title by winning all three of her singles matches. On both Saturday and Sunday, Eichkorn dropped the first set before battling to three-set victories against ranked opponents. 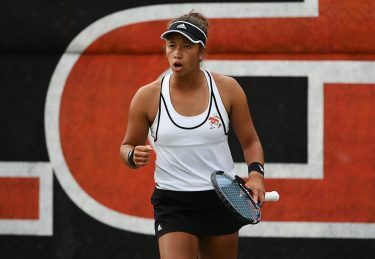 She upset 79th-ranked sophomore Liset Brito of Florida International, 3-6, 6-2, 6-4, for the title, and 53rd-ranked junior Lauren Macfarlane of Florida State in a three-set marathon, 2-6, 7-6, 6-4, in Saturday’s second round. Junior Claudia Wasilewski, sophomore Jenna Osborne and freshman Alessa Waibel finished the weekend with 2-1 singles records. Brito and junior Priscilla Castillo took home the doubles championship for FIU. Florida State and Central Florida also competed in the tournament. The fall season is also finished for the women’s team as it prepares for the start of the spring season in 2009.